Background Follow-up infarct volume (FIV) has been recommended as an early indicator of treatment efficacy in patients with acute ischemic stroke. Questions remain about the optimal imaging approach for FIV measurement. Objective To examine the association of FIV with 90-day modified Rankin Scale (mRS) score and investigate its dependency on acquisition time and modality. Methods Data of seven trials were pooled. FIV was assessed on follow-up (12 hours to 2 weeks) CT or MRI. Infarct location was defined as laterality and involvement of the Alberta Stroke Program Early CT Score regions. Relative quality and strength of multivariable regression models of the association between FIV and functional outcome were assessed. Dependency of imaging modality and acquisition time (≤48 hours vs >48 hours) was evaluated. Results Of 1665 included patients, 83% were imaged with CT. Median FIV was 41 mL (IQR 14–120). A large FIV was associated with worse functional outcome (OR=0.88(95% CI 0.87 to 0.89) per 10 mL) in adjusted analysis. A model including FIV, location, and hemorrhage type best predicted mRS score. FIV of ≥133 mL was highly specific for unfavorable outcome. FIV was equally strongly associated with mRS score for assessment on CT and MRI, even though large differences in volume were present (48 mL (IQR 15–131) vs 22 mL (IQR 8–71), respectively). Associations of both early and late FIV assessments with outcome were similar in strength (ρ=0.60(95% CI 0.56 to 0.64) and ρ=0.55(95% CI 0.50 to 0.60), respectively). Conclusions In patients with an acute ischemic stroke due to a proximal intracranial occlusion of the anterior circulation, FIV is a strong independent predictor of functional outcome and can be assessed before 48 hours, oneither CT or MRI. In current trials investigating stroke treatment, efficacy is generally evaluated by assessment of functional ability and physical limitations of patients rated on a relatively coarse scale such as the modified Rankin Scale (mRS). In the causal chain of acute ischemic stroke, treatments are designed to save or preserve brain tissue, which subsequently translates to improved functional outcome. Following the positive outcome of the five trials proving the efficacy of endovascular treatment (EVT) in patients with anterior circulation acute ischemic stroke due to large vessel occlusion,1–5 it has been advocated that the volume of ischemic tissue injury may serve as an early signal of treatment efficacy and, consequently, as a surrogate endpoint for phase II trials.6 Indeed, most trials also showed the benefit of EVT, with a smaller infarct volume in patients treated with EVT. Patient-level data of seven major randomized controlled trials that studied the benefit of EVT in acute ischemic stroke provided us with an extensive dataset to examine the association of FIV with 90-day mRS score. In addition, this dataset allows the investigation of the dependency of FIV assessment on acquisition time and modality. Trial investigators of ESCAPE, EXTEND-IA, SWIFT PRIME, REVASCAT, MR CLEAN, PISTE, and THRACE established the Highly Effective Reperfusion Evaluated in Multiple Endovascular Stroke Trials (HERMES) collaboration.1–5 13 14 These seven randomized controlled trials investigated the benefit of EVT using second-generation mechanical devices in patients with anterior circulation ischemic stroke. Design features and inclusion criteria of the contributing trials have been described previously.13–15 The seven trials were approved by a local central medical ethics committee and the research boards of all participating centers. Written informed consent was acquired from all patients or legal representatives. According to the original trial imaging protocols, all participating sites were required to perform 24-hour follow-up imaging and were free to choose between CT and MRI. Participating centers from MR CLEAN and THRACE were additionally requested to perform follow-up imaging at 5 days, or at hospital discharge. In EXTEND-IA, ESCAPE, SWIFT PRIME, REVASCAT, and PISTE, 5-day follow-up imaging was at the discretion of the intervention site. We included all patients with follow-up non-contrast CT (NCCT) or MRI carried out at least 12 hours and up to 2 weeks (336 hours) after stroke symptom onset. Tissue outcome was assessed on follow-up NCCT or MRI. If multiple follow-up scans were available, the latest scan was selected for analysis with an upper limit of 2 weeks after onset. If both NCCT and MRI were performed, MRI was the preferred modality. FIVs were initially outlined using previously validated software.16 Manual adjustment of lesion boundaries was performed by an expert neuroradiologist (WHvZ, LFMB, or CBLMM), when appropriate. Areas with parenchymal hemorrhage (within or adjacent to the infarct), cerebral edema extending into the contralateral hemisphere, and those causing ventricular and sulcal effacement were included in the lesion. In cases of decompressive hemicraniectomy with no available pre-surgery scan, only the ischemic lesion within the theoretical boundaries of the skull was included. A consensus reading with two neuroradiologists was performed to resolve any discrepancies. All imaging assessments were performed blinded to treatment assignment, study trial, and clinical findings (apart from baseline imaging to identify and eliminate old infarcts from the analysis). FIVs were calculated in milliliters (mL) by multiplying the number of voxels of the segmented ischemic lesions with its voxel size. Infarct location was assessed by the same neuroradiologists (WHvZ, LFMB, or CBLMM) and defined by laterality (left or right hemisphere) and involvement of the 10 distinct anatomical regions of the Alberta Stroke Programme Early CT Score (ASPECTS) template.17 For MRI, ≥20% infarction within an ASPECTS region was classified as an infarct-positive region. The total follow-up ASPECTS was calculated. Hemorrhagic transformations were scored according to the anatomical description of the Heidelberg Classification.18 For cases of multiple intracranial hemorrhages, all were scored. The primary outcome was the degree of disability as scored on the mRS at 90 days, considered as an ordinal outcome.19 The mRS score is a common measure of patient functional outcome after stroke, ranging from 0 (no symptoms) to 6 (death). Dichotomized functional outcomes were patients with excellent outcome, defined as mRS score 0–1 versus 2–6; patients with functional independence, defined as mRS score 0–2 versus 3–6; and death (mRS score 6 vs 0–5). A detailed description of the statistical analysis plan is provided in the online-only supplements. Dichotomous variables were presented as proportions while continuous variables were tested for normality (Shapiro-Wilk test) and presented as mean ±SD if normally distributed, or as median and IQR if not. The association between FIV and ordinal mRS score was estimated with adjusted and unadjusted ordinal or binary logistic regression, and expressed as odds ratio (OR) with 95% confidence intervals (CIs). For the primary outcome, ordinal logistic regression was performed and for dichotomized secondary outcomes, binary logistic regression was employed. All multivariable regression analyses included the prespecified prognostic variables age and baseline National Institute of Health Stroke Scale (NIHSS) score. Missing variables were included after imputation of the relevant covariate with median values of the non-missing data. Four mixed models were constructed: model A included FIV, model B included FIV and infarct location (laterality and ASPECTS), model C included FIV and hemorrhage type, and model D included FIV, infarct location, and hemorrhage type. To account for between-trial variance, we used mixed-effects modelling with a random effect for the trial incorporated in all models. The likelihood function test, Akaike’s Information Criterion, was used to determine which model provided the best relative quality. Three-dimensional surface plots were constructed to show the relation between the adjusted probability of functional outcome, FIV, and the prognostic variables age and baseline NIHSS score. The diagnostic capability of FIV to predict dichotomized mRS was assessed by receiver operating characteristic (ROC) analysis. Thresholds for FIV were calculated for predicting unfavorable outcome (mRS score 3–6) with specificities of 80%, 90%, and 95%. Baseline characteristics were compared with assessed differences in subjects imaged with CT and MRI, and in subjects for whom imaging was acquired within 48 hours of onset versus after 48 hours (and up to 2 weeks). The Mann–Whitney U test was performed to test for differences in FIV. We selected the model that provided the best relative quality, and tested whether the relation between FIV and mRS differed between the imaging modalities and between the timings of follow-up image acquisition. The strength of association between FIV and mRS for each imaging modality and follow-up acquisition time was calculated using partial Spearman correlations, correcting for age, baseline NIHSS score, and treatment assignment to control for potential confounding effects of those covariates. All statistical analyses were performed in SAS version 9.4 (SAS Institute, Cary, North Carolina, USA) and R version 3.2 (R Foundation for Statistical Computing, Vienna, Austria). P values were two-sided and a value of P<0.05 indicated statistical significance in all analyses. After pooling and screening data from the seven trials, 1690 (95.8%) of 1764 patients had follow-up imaging acquired at least 12 hours after stroke symptom onset and before 2 weeks. Twenty-five patients were additionally excluded because of poor image quality or difficulties precluding accurate lesion determination, leading to a total of 1665 included patients. These difficulties included large diffuse hemorrhages (n=12), extreme motion artefacts (n=8), diffuse cerebral ischemia (n=2), bihemispheric ischemic lesions (n=2), and incomplete image reconstruction (n=1). Baseline characteristics of the total population are presented in online supplementary table S1. Among 1665 patients, median age was 68 (IQR 57–76) years, and 781 (46.9%) were female. Median baseline NIHSS score was 17 (IQR 13–21), 790 (44.4%) had a left-sided infarct, 844 (50.7%) were randomized to EVT, and 1496 (90%) received intravenous thrombolysis. The majority (n=1383; 83%) had follow-up NCCT and the remainder MRI. Median FIV was 41 mL (IQR 14–120 mL) and median mRS score at 90 days was 3 (IQR 2–4), with 651 (39%) achieving functional independence (mRS score 0–2). Eight hundred and ninety-four (56%) of the 1598 patients with timing reported had follow-up imaging within 48 hours. The distribution of FIV per mRS category is depicted in figure 1, which demonstrated progressively larger FIVs as the mRS score increased (Spearman’s ρ correlation coefficient, 0.58; P<0.001). Results of the regression analysis of the association between FIV and mRS, and of the likelihood function test are shown in table 1. Follow-up infarct volume distribution per modified Rankin Scale (mRS) score. The results of each individual model are presented in online supplementary table S2. FIV was independently associated with mRS score in addition to age and baseline NIHSS score (P<0.001 for all three variables across all models). Model D, which includes location and hemorrhage type, was the superior model with Akaike’s Information Criterion of 4775. This best relative quality was principally due to involvement of the internal capsule (OR=0.45; P<0.001) and to a lesser extent M5 ASPECTS regions (OR=0.77; P=0.042), intraventricular hemorrhage (OR=0.29; P=0.002), and hemorrhagic infarct type 2 (OR=0.71; P=0.043). Laterality (P=0.36) was not an independent predictor of functional outcome. Three-dimensional surface plots of the effects of age, baseline NIHSS score, and FIV on the likelihood of a favorable outcome are depicted in online supplementary figure 1a, b. These illustrate the importance of age, and show that even with a small FIV, the chance of reaching functional independence is drastically reduced in older patients. Moreover, patients can still achieve favorable outcomes despite having stroke-related neurologic deficit at baseline. The relation between FIV adjusted for prespecified prognostic variables and estimated probability for excellent outcome, favorable outcome, and death is displayed in online supplementary figure 1c. ROC analysis to classify favorable and unfavorable outcome by FIV showed an area under the curve of 0.80. ROC analyses for all dichotomized outcomes are shown in online supplementary figure 2. Thresholds for FIV with high specificities for an unfavorable outcome (mRS score 3–6) are displayed in table 2, and show that reaching an unfavorable outcome is almost inevitable with a specificity of 95% (95% CI 92.3 to 97.1) when the infarct volume exceeds 133 mL. Thresholds calculated for each imaging modality are presented in online supplementary table S3. Outcome characteristics stratified by imaging modality and follow-up acquisition time are presented in online supplementary tables S4 and S5. We found significantly lower FIVs in subjects studied with MRI (median of 22 mL) compared with subjects imaged with CT (median of 48 mL) (P<0.001). Also, patients who underwent MRI had lower 90-day mRS scores and rates of hemorrhagic infarct type 2 (HI-2), higher reperfusion rates, and shorter time from onset to follow-up imaging. Lower rates of hemorrhagic infarct type 1 (HI-1) and remote parenchymal hemorrhage were observed in patients who were imaged with CT. We found that the mRS score was not significantly different (P=0.28) for patients in whom FIV was assessed with CT compared with MRI in model D, which incorporated lesion location and hemorrhage type as a predictor in addition to age and baseline NIHSS score. A significant difference in FIV was found between patients who had early versus late follow-up imaging, with a median of 32 mL in images acquired up to 48 hours versus 56 mL in those acquired past 48 hours (P=0.042). Our results show that the relation between FIV and mRS score was not significantly different between follow-up acquisition times (P=0.36). The strength of correlation between FIV and mRS score was moderate and statistically significant with a Spearman’s ρ of 0.58 (P<0.0001). The correlation of FIV measurements for each imaging modality and follow-up acquisition time with mRS score are shown in table 3, and were all similar in strength, ranging from a Spearman’s ρ of 0.55 for FIV assessment on imaging after 48 hours to a Spearman’s ρ of 0.60 for FIV assessment on imaging up to 48 hours. Our analysis of the HERMES dataset shows that FIV is an independent predictor of functional outcome in patients with acute ischemic stroke due to a proximal intracranial occlusion of the anterior circulation in addition to age and baseline NIHSS score. 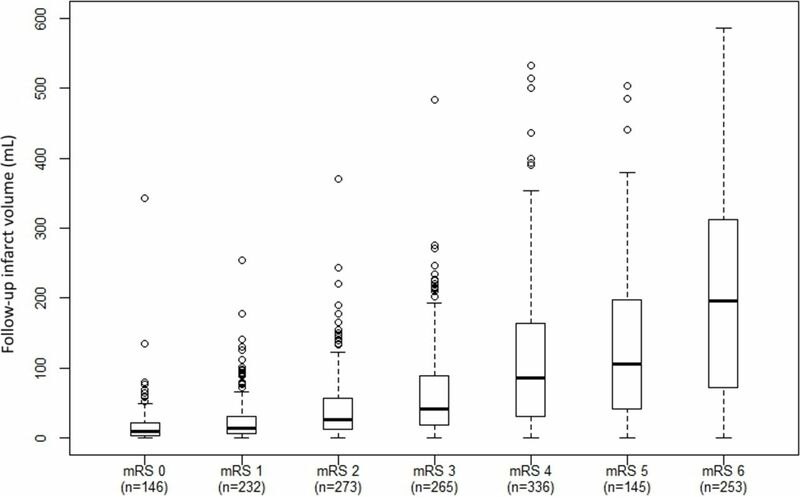 We found a strong association between FIV and 90-day mRS score, indicating that it might be suitable as a surrogate biomarker for functional outcome after acute ischemic stroke presenting within the 0–6 hour window. The relation between FIV and functional outcome was consistent across all models, in which FIV proved to be an independent predictor. Addition of lesion location and hemorrhage type increased the predictive value of the models. The negative effect of outcome ASPECTS involvement on functional outcome was mainly driven by the influence of the internal capsule and the M5 region. These regions may include the corticospinal tract and the motor cortex, which emphasizes the pivotal role of damage to these areas in determining functional independence of patients. The Stroke Treatment Academy Industry Roundtable (STAIR) IX report questioned the optimal imaging modality and timing for FIV assessment.6 In our study, we observed larger volumes when FIV was assessed by CT. This is possibly because trials which had stricter inclusion criteria towards smaller cores at baseline routinely performed more MRI than others. Although we observed large differences in FIV between modalities, our model showed that functional outcomes of patients assessed by CT or MRI were similar. This is probably owing to the diluting effect of the infarct location on the relation between FIV and functional outcome. What is important, is that we demonstrated similar correlations with functional outcome for both CT and MRI. Several studies have previously assessed the relation between FIV and functional outcome on the 90-day mRS score after proximal anterior circulation stroke.9 10 20 21 All these studies report that FIV is a strong predictor of functional outcome, independent of other known important factors such as age and baseline NIHSS score. Our study confirms these results in the largest patient-level dataset on EVT to date. This unique dataset also allowed us to answer questions about how different imaging approaches affected the interaction of FIV and functional outcome. Of note, once FIV and baseline NIHSS score were included in our models, infarct laterality was not an independent predictor of outcome, suggesting that the baseline NIHSS score captures most of the stroke lateralization effect. Our results also show that, in patients with hemorrhagic transformation, hemorrhagic infarct type 2 (HI-2) was a stronger predictor of functional outcome than parenchymal hematoma type 2 (PH-2). In contrast, previous studies have reported that PH-2 is more strongly associated with clinical deterioration because of its space-occupying effect.22 23 These conflicting results might occur because most of the mass effect of PH-2 was captured by FIV in our models, since parenchymal hematomas were considered part of the lesion volume, leading to a diminished independent effect. Another explanation might be that PH-2 often leads to extensive damage, resulting in leakage of blood into other spaces.24 Therefore, the unfavorable effect of PH-2 might have been captured by intraventricular hemorrhage in our models, which in our study is associated with poor clinical outcome. This study has some limitations. Follow-up NIHSS score, a strong predictor of 90-day mRS score, was not included in our models, as this was not recorded in most of the trials included in our meta-analysis. Second, infarct location assessment was restricted to follow-up ASPECTS regions combined with lateralization. A more detailed analysis on the location of brain tissue injury may improve the strength of the relation between FIV and functional outcome, as this more closely resembles brain eloquence.25 Finally, we compared different populations to assess the optimal imaging modality and timing for FIV measurement. As some trials routinely performed more MRI than others, and had different inclusion criteria, this might have biased our results. However, the distribution of patients with MRI-based assessments was fairly even across the different trials, minimizing this effect. In contrast, as almost all late follow-up imaging were from MR CLEAN and THRACE, this finding is heavily confounded by study effect. MR CLEAN had no restrictions to baseline parenchymal imaging except for the presence of intracranial hemorrhage. As a consequence, most patients with large FIVs on early follow-up imaging were from MR CLEAN. In addition, reperfusion rates varied per study, which also contributes to infarct size. In order to fully explore the influence of imaging modality and timing on FIV assessment, comparisons must be performed in an intra-patient, rather than an inter-patient fashion. We strove to overcome this limitation by using adjusted partial Spearman correlations to control for potential confounding effects. Nevertheless, adequate validation can only be achieved by prospective studies with prespecified time points for FIV assessment. Our study provides useful estimates of high specificity FIV thresholds that may help to identify patients for whom reaching functional independence at 90 days is unlikely, potentially influencing patient management after stroke, particularly decisions taken on disposition. Furthermore, the HERMES data suggest that FIV can be measured as soon as after 12 hours, with the major advantage that most patients are still at the intervention hospital, which would minimize loss to follow-up. In addition, we found that FIV assessed on CT offers similar strength in predicting functional outcome to that achieved with MRI. This is important, as CT is cheaper and more widely available in many countries. FIV has been suggested as surrogate endpoint in early-phase EVT trials, where the aim is to rapidly evaluate the direct biological effect of therapy. In order for a potential surrogate endpoint to be used rather than the clinical endpoint, the effect of therapy on that surrogate endpoint must accurately reflect and predict the effect on the clinical endpoint.26 We found a strong association between FIV and 90-day mRS score, regardless of imaging approach, which is a crucial first step for a potential surrogate endpoint. Future studies must examine the full potential of FIV as a surrogate through formal testing of the causal chain of treatment–FIV–functional outcome. In summary, this analysis of HERMES confirms that FIV is a strong independent predictor of functional outcome at 90 days in patients with acute ischemic stroke due to a proximal intracranial occlusion of the anterior circulation presenting within 6 hours after onset. Our data suggest that FIV might be suitable as a prognostic biomarker for functional outcome in acute ischemic stroke, irrespective of imaging modality and time to follow-up imaging.
. Use of the Alberta Stroke Program Early CT Score (ASPECTS) for assessing CT scans in patients with acute stroke. AJNR Am J Neuroradiol 2001;22:1534–42. AMMB and IGHJ contributed equally. HAM and CBLMM contributed equally. Contributors All four criteria for authorship are met: AMMB and IGHJ prepared the first draft. AMMB, IGHJ, MG, and MDH conducted the literature research. AMMB, CBLMM, HAM, WHvZ, HFL, AJY, DSL, MG, MDH, AMD, BCVC, PJM, DWJD, and PW participated in the study design. AMMB, CBLMM, WHvZ, RJvO, AvdL, LFMB, AJY, DSL, NA, MB, SeB, FG, JLM, TM, CO, SS, JT, JHH, MAA, AMD, BKM, BCVC, RGN, PJM, RdMdR, PW, KWM MMB, DWJD, YBWEMR, AD, TGJ, and MR participated in data collection. ScB did the statistical analysis. AMMB, IGHJ, CBLMM, HAM, WHvZ, HFL, RJvO, AvdL, IGHJ, AJY, ScB, DSL, NA, SeB, FG, JLM, TM, CO, JT, MG, MDH, AMD, BKM, BCVC, RGN, GWA, KWM, LSR, MR, JB, PC, DWJD, TGJ, and LA participated in data interpretation. All authors critically reviewed the manuscript and approved the final version. AMMB and IGHJ contributed equally, as did CBLMM and HAM. Funding This work was supported by Medtronic through an unrestricted grant to the University of Calgary. Competing interests MG reports grants from Covidien, personal fees from Covidien, during the conduct of the study; MG has a patent for diagnosing strokes (PCT/ CA2013/000761) licensed to GE Healthcare. BKM reports membership of the Steering and Executive Committee, ESCAPE trial that received support from Covidien Inc., Site Principal Investigator, SOCRATES Trial, sponsored by Astra Zeneca, honoraria from Penumbra Inc., a provisional patent 62/086077 for triaging systems in ischemic stroke, research funding from CIHR, HSFC, AIHS, HBI and the Faculty of Medicine, University of Calgary and board membership of QuikFlo Health Inc. WHvZ reports Honoraria; Modest; Stryker (paid to Institution). DWJD reports honoraria; Modest; Stryker (paid to Institution). PJM reports unrestricted grant funding for the EXTEND-IA trial to the Florey Institute of Neuroscience and Mental Health from Covidien (Medtronic), has served as an unpaid consultant to Codman Johnson and Johnson, his organization has received unrestricted research funding and grants from Codman Johnson and Johnson, Medtronic, and Stryker. AMD reports grant support and personal fees from Covidien (Medtronic). AD reports consultant/Advisory Board; Modest; Medtronic Neurovascular (Steering Committee STAR). CBLMM reports speakers' Bureau; Modest; Stryker (paid to institution). GAD reports grants from the Australian National Health & Medical Research Council, non-financial support from, and has served on advisory boards for Boehringer Ingelheim, Astra Zeneca, Bristol Meyers-Squibb, Merck Sharp & Dohme outside the submitted work. BCVC reports research support from the National Health and Medical Research Council of Australia (GNT1043242, GNT1035688), Royal Australasian College of Physicians, Royal Melbourne Hospital Foundation, National Heart Foundation, National Stroke Foundation of Australia and unrestricted grant funding for the EXTEND-IA trial to the Florey Institute of Neuroscience and Mental Health from Covidien (Medtronic). MDH reports unrestricted grant funding for the ESCAPE trial to University of Calgary from Covidien (Medtronic), and active/in-kind support consortium of public/charitable sources (Heart & Stroke Foundation, Alberta Innovates Health Solutions, Alberta Health Services) and the University of Calgary (Hotchkiss Brain Institute, Departments of Clinical Neurosciences and Radiology, and Calgary Stroke Program); personal fees from Merck, non-financial support from Hoffmann-La Roche Canada Ltd, outside the submitted work; MDH has a patent Systems and Methods for Assisting in Decision-Making and Triaging for Acute Stroke Patients pending to US Patent office Number: 62/086,077 and owns stock in Calgary Scientific Incorporated, a company that focuses on medical imaging software. AMMB and HAM own stock in Nico.lab, a company that focuses on medical imaging software. TGJ has consulted for Codman Neurovascular and Neuravi, holds stock in Silk Road and Blockade; has acted as an unpaid consultant to Stryker as PI of the DAWN trial and served as an unpaid member of a Medtronic Advisory Board. SMD reports lecture fees from Covidien (Medtronic). ScB acts as consultant for Medtronic. GWA reports equity and consulting for iSchemaView (imaging software) and consulting for Medtronic.